"Exfoliation, or the removal of dead corneum cells, can improve the look of most skin types" (Gerson, 2004). Exfoliating should be a step in your skin care regimen, but how often should be determined by your skin type. Most people only need to exfoliate once a week, anymore than that and there's a risk of damaging your skin and capillaries. Remember that I mentioned that the skin replaces itself about every 30-60 days? Exfoliating helps to speed this process up in a gentle way, when done properly. Your skin type needs to be taken into account when determining how often YOUR face needs exfoliating throughout the week. Below are a list of Skin Types and details about each one. What do you believe is your skin type? From this point, if you have a good idea of what your skin type is, you can then determine how often YOU need to incorporate exfoliating into your skin care regimen. *When exfoliating twice a week, do not do this two days in a row. Separating this step with a few days in between allows for your skin cells to regenerate well. Young Living has a wonderful Satin Mint Facial Scrub that gently exfoliates and refreshes your skin. 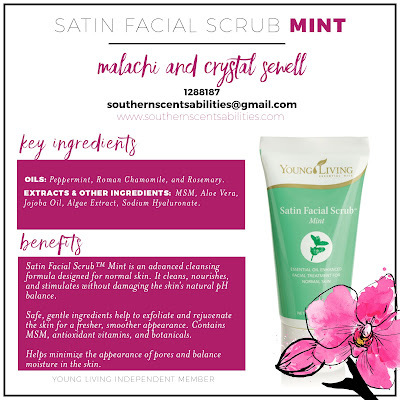 The Satin Mint Facial Scrub contains wonderfully nourishing ingredients: Peppermint, Roman Chamomile, and Rosemary Essential Oils, MSM (sulfur component - not from shellfish), Aloe Vera, Jojoba Oil, Algae Extract, Sodium Hyaluronate, Mango Seed Butter, and nourishing vitamins. Did you know that the ideal pH level of your skin is about 5.5? After cleansing and exfoliating disrupts the pH balance of your skin and it can take up to an hour to restore back to its natural pH. Is there something we can do to restore it faster? Absolutely! We will talk toning next time. Gerson, J. (2004). Milady's Standard Fundamentals for Estheticians. Canada: Thomson Delmar Learning.